I left home at about 1 o'clock and headed for the skiing place where the Japan Rally Championship was held early Saturday morning. I attended the meeting as an official. When I reached the designated meeting place at 3 o'clock, I found my role on the staff members' list. 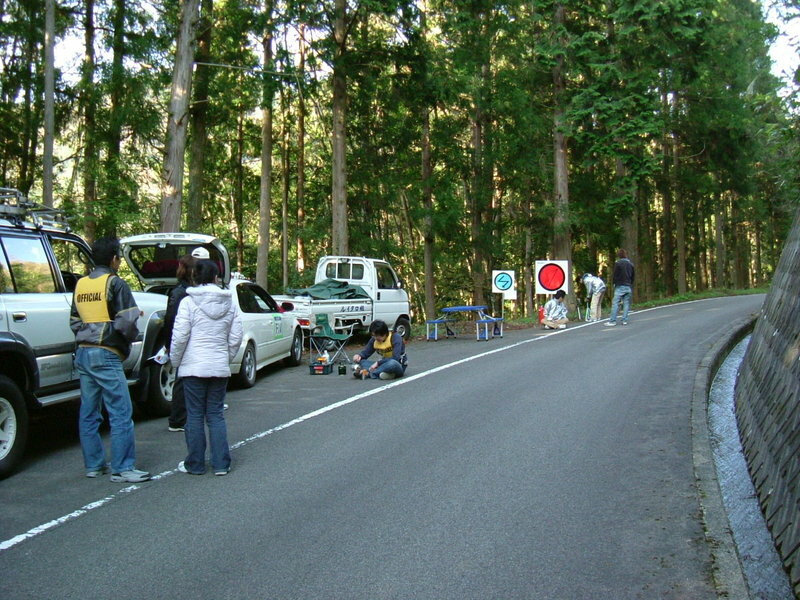 To tell the truth, I wanted to watch rally vehicles moving at full speed at a viewing point set in the forest, but I was asked to stay at the starting point of the special stage in case an accident occurred. As a result, no accident that needed medical care occurred. I came to enjoy basking in the woods. As I expected, the Japan Rally Championship was more pomp-filled than local competitions. The cars were awfully fast. They must be expensive. There were many service trucks at the service point. Those trucks seemed to be like a factory. I posted some pictures in the album shown in the left column. Have a look at them. A fire broke out near my hospital today. It was about noon. My hospital is located in the heart of the city and the streets were heavily packed with business people going out for lunch. The fire occurred in a building that was being pulled down, so the damage was not so much, I think. The building is at the busiest corner in the city. There is the headquarters of the main local bank and the branch of the Japan National Bank at the opposite side of the corner. This intersection was locked for a couple of hours. It was like a scene from a movie. 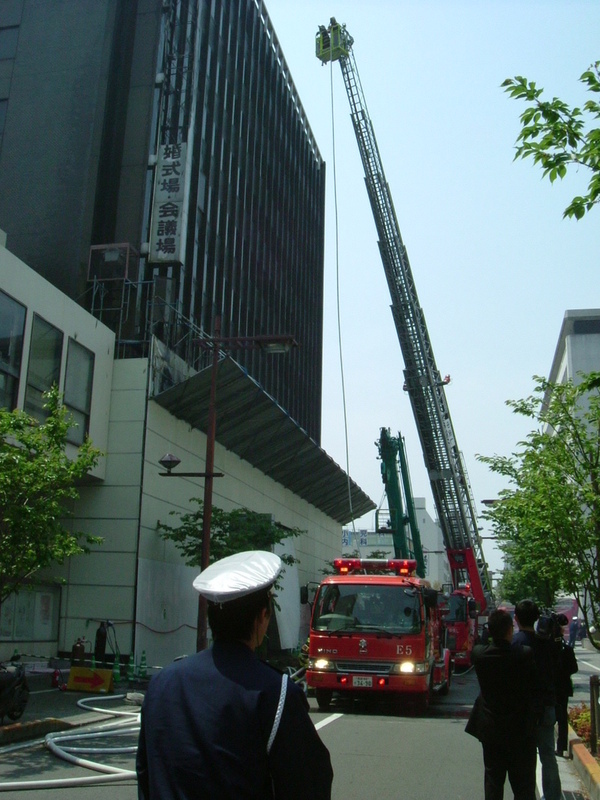 It was the first time I had seen an aerial ladder truck actually working. A firefighter was on the top of the ladder, at about the 8th-10th floor level. I'm scared of heights. I admired him. I have been using a fantastic watch. This watch can produce power from the sunlight or other electric lights. It means that we don't need to replace the batteries of the watch. If this watch were left in a dark place like drawers, what do you think this watch would do? Lo and behold, it sleeps with its brain recording the time. The watch saves power and survives for 2 years with all hands stopped. When it is taken out in the light, it starts moving. If you see the moment that the watch starts moving, you might laugh at the movement. As if someone walked in on the watch and saw it dodging work, it would start moving promptly. It's funny. One more thing. 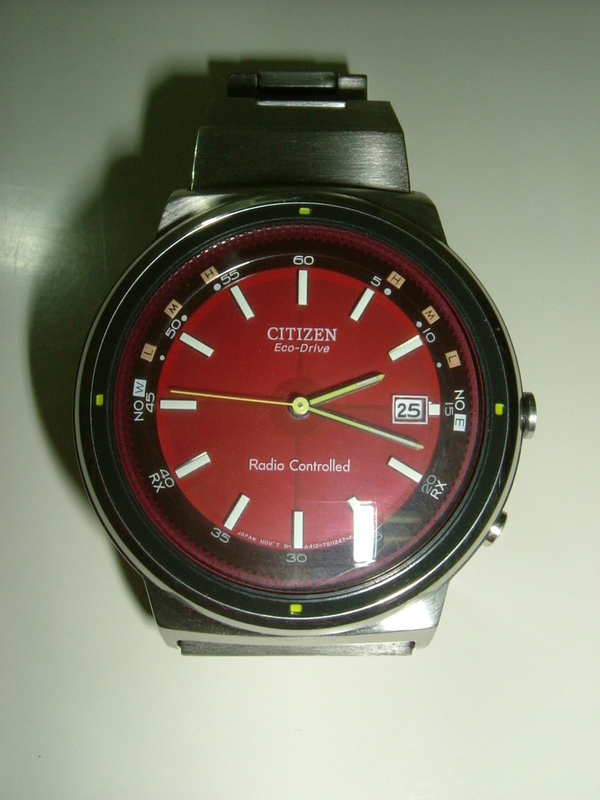 The watch automatically receives the data of the time and date by radio waves once a day. That is to say, it always ends up showing the absolutely accurate time. The watch that never stops and never goes wrong. Watches have only to show the accurate time. If all people thought like this, the watch manufactureres would get into difficulties. I have one more watch that is made in Switzerland. It cost 8 times more than my radio-controlled watch. This watch, TAG Heuer, looks and is really luxurious and shows the time accurately but it is inferior to the radio-controlled or radio-assisted watch in accuracy. It is only in Canada that I put this TAG Heuer on, because the radio waves from Japan can't reach Canada. Maria walked in on them and saw the gun. The mayor of Nagasaki city, which is famous as the victim city of the atomic bomb, was shot and killed by a thug. The mayor was totally innocent. He has been calling for the total abolition of nuclear weapons for a long time. He was only 61 years old. He would have done a great job if he had time. I feel sorry for his bereaved family. Heinous crimes are getting popular in Japan these days, clouding the future of the myth of a safe society. What's happening in Japan? It has been warm recently, but today was cold and rainy. It was snowing in the mountains, a 2 hours' drive from here. It's fairly unusual. Various forms of highly unusual weather have been occuring worldwide. I feel gloomy about the abnormal climate. Today is paper garbage collction day. We must separate recyclable from non-recyclable trash. We have to put paper trash into a paper bag and bind it with paper lines. It is prohibited to put it into plastic shopping bags or cardboard boxes, because they are not disposed of in the same way as paper. 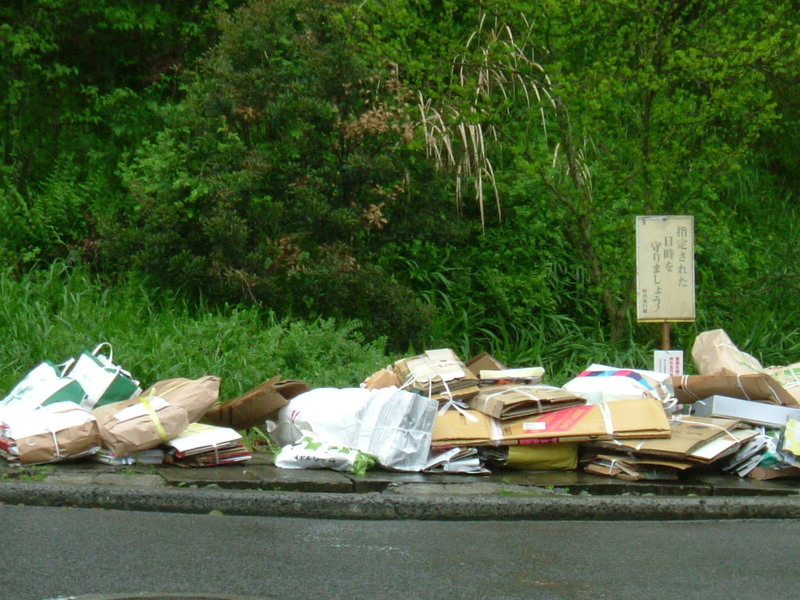 I'm afraid that the paper trash will gain weight absorbing the rain today. The other day, I got an e-mail from the UK. It seems that all the trash is not burned up and thrown into the landfill in the UK. Consequently, they don't have to separate the trash in the UK. I was surprised to hear that. I'm not sure, but the UK has a certain reason why they don't burn it up. On the other hand, in the case of Germany, I sometimes post entries at a couple of German blogs. The owner of one of those blogs kindly reads and corrects my writing in German. He told me about the collection of garbage in Germany. There are some kinds of containers in front of each house, with a larger container for apartments or dormitories. People throw garbage into the containers according to the rules; burnable or non-burnable and what it is made from. Which reminds me, I've seen such trash containers at Whistler in Canada. These containers can prevent the trash from getting wet on rainy days and keep bears or birds away from us. I think it's good, but I don't like to see those dirty containers all the time. The photo shows the waste collection site that my family uses. It is just across the street from my house. It is raining today. Though the trash is wet and looks like a mess, it will be collected until 9 o'clock in the morning and the site will be tidy. First of all, look at the picture. It's the CT scan of my abdomen, just the navel level. Nowadays "metabolic syndrome" gets a lot of publicity in the media in Japan. Many people have a certain interest in the metabolic syndrome. If you don't know this unhealthy status, see the following url. As you know, it is different from the criteria of the American Heart Association. If you meet condition 1 and also 2 or 3 or 4, you are going to be diagnosed with metabolic syndrome. Much evidence has proved this unhealthy status develops serious illnesses. It's important to prevent such a development. My hospital is going to provide the screening of the metabolic syndrome for citizens. Prior to the public announcement, about 20 staff members of my hospital became human guinea pigs. I was one of them. X-ray technicians calculate the portion of subcutaneous and visceral adipose tissue on the CT scan. They are debating which color they will use for standing for the adipose tissue. 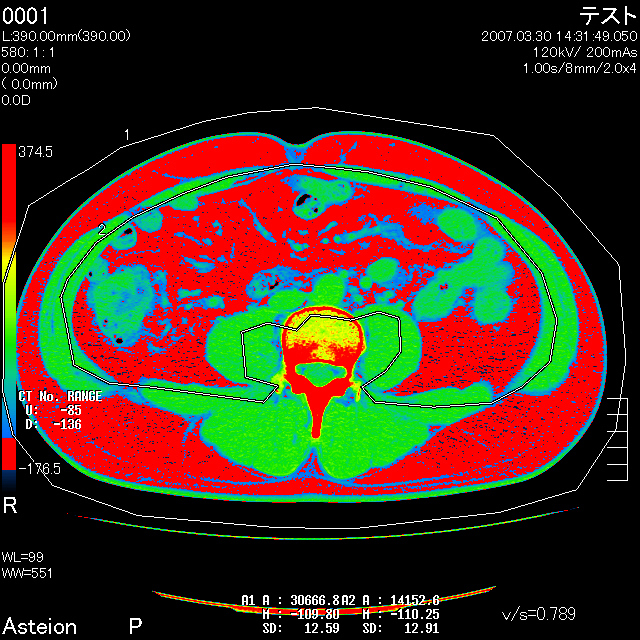 In my scan film, the fat is displayed in red, and the muscle is in green. The red is frequently used as a warning color in general. It proved that I am a visceral-dominant type, and it's not good. Fortunately, the condition that I met is No.1 only, so I wasn't sentenced to a consultation with nutricians. It's true that I'm out of the criteria of the metabolic syndrome, but I'm sure to be on the border. One more thing. I was surprised and sad to examine the rectus muscle of my abdomen on the CT scan film. My muscle was very thin. It looked very weak. I had been thinking I'm active and powerful for my age. I found it was a vain illusion. It seems that I need some action. All my family went to see my dog, Mocha, who lives in the training school. It was the first time in 20 days. I found he had become more friendly. It was fun for me to talk with his trainers. I realized that the experts know best. Better leave it to a specialist. When I left the school, I was missing him. He's going to come back at the end of this month. I'm looking forward to seeing him. I got back from Osaka by the last flight today. I left Osaka International Convention Center and went to Shin-Osaka by subway at about 5:00. I noticed at Shin-Osaka station that there were many police vehicles, not only police cars, but anti-riot police buses. What's happened? I wondered. I wanted to see them for a while, but I did't have enough time before my flight. I got on an airport limousine in a hurry. In the bus I heard the announcement that Wen Jiabao was coming to Osaka airport now and there was a strict enforcement of traffic control by the police and besides there was a 2-car pile-up, so you will be more than 30 minutes late. I always spend most of the time in the airport seeing the planes from the observation deck with a canned coffee. I feel relaxed with it, but today it was prohibited to go up to the deck despite not having a gun. (grin) I had no choice. There are some extremists in Japan, too. I hope he'll leave for China without any trouble. My departure time was at 7:35 pm. Though I didn't know his departure time, I suspected that our departure time was alike. I'd like to see the his actual features and looked for him instead of seeing the aircraft. I asked some policemen when and where he would show up. They said nothing useful. It must be secret. Finally, I looked for his face on TV in my living room. He was always smiling in Japan. It's not bad. However he didn't hold any press conference in Japan. It's extremely exceptional and unusual. Besides he didn't provide any answers to open questions. I wondered why there are a lot of disagreements between the two countries. I've been in Osaka for 2 days to attend the 106th Annual Congress of Japan's Surgical Society. In this meeting the results of many researches and trials are reported. I make it a rule to join it every 2,3 years. Why do I have to participate in the meeting, even though I can get up-to-date information in the internet? There are two reasons. One is the exhibition of medical equipment; diagnostic instruments, special instruments for many kinds of operetions and especially electronic medical charts, this time. I could touch those instruments. It was intersting to draw outlines of a face or an abdomen with an electronic pen and a tablet. The agents emphasized that you can save space for stocking charts and films. I thought it was exactly correct. The other reason is to see old friends. 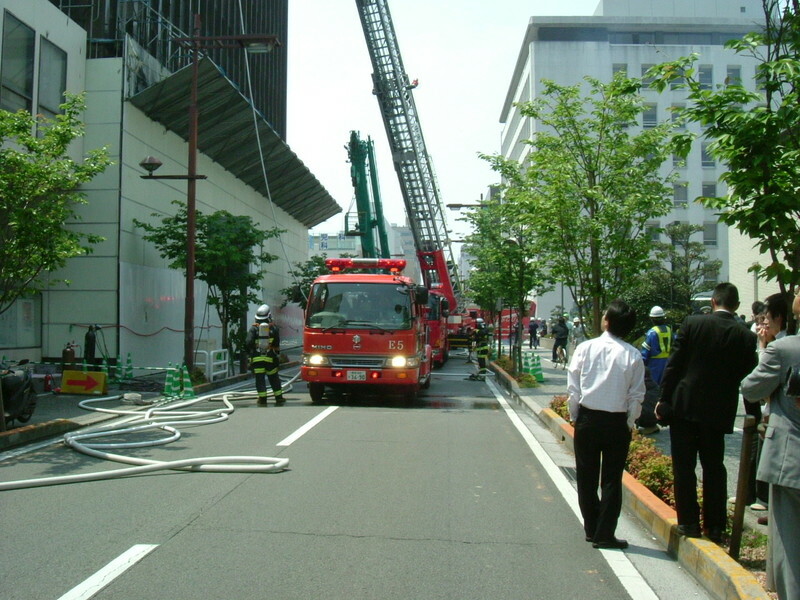 In my resident days I was working in a big emergency hospital in Osaka. In this Congress I met more than 10 friends and with a few of them I had a nice dinner. As we wish China and Japan the best of friendship and amity, we extend our heartfelt welcome to Your Excellency’s visit to Japan. We have been conducting research on the Nanking incident, which is said to have occurred during the war between Japan and China in Nanking in December 1937. Results of our research have caused us to have serious doubts regarding views of this incident commonly held in your country. Thus, in this matter, we would appreciate receiving your response to the questions posited below. 1. The late-leader Mao Zedong never mentioned the “Nanking massacre”. His only reference to the Nanking occupation was a personal observation he made when he stated, “the Japanese forces had many surrounded, but not many were killed,” in his book titled, On Protracted War, a summation of his lectures given at Yanan, China six months after the battle occurred in December. If the incident, with claims of 300,000 citizens massacred, did take place, it must have been like last century’s holocaust. Is it not unnatural and strange that Mao Zedong did not say a word about the incident? How do you account for this fact? 2. In November 1937, just before the siege of Nanking, the Nationalist Party, organized by the nationalists and communist organizations, created an international propaganda department within its Central Propaganda Office. According to a confidential report titled, "Outline of Operations: the International Propaganda Department, the Central Propaganda Office", between December 1, 1937 and October 24, 1938 the International Propaganda Department held 300 press conferences in Hankou. According to records kept at the time, an average of 35 people attended these press briefings comprised mainly of journalists and officials of foreign embassies. And, in the 300 briefings, no mention was ever made of “citizens being massacred in Nanking,” or “hostages being murdered unlawfully”. What do you think of this fact? If massacres were committed, is it not a mystery as to why they were not mentioned? 3. The activities of an international committee which cared for the Nanking citizens who congregated in the Nanking Safety Zone were recorded. Under the auspices of the Council of International Affairs of the nationalist government, the record was published in book form titled Documents of the Nanking Safety Zone by a publisher in Shanghai in 1939. According to the book, the population of Nanking stood at 200,000 prior to the Japanese occupation. This population level remained unchanged during December. Records show the population to be 250,000 one month after the Japanese occupation of the city began. Then, based on these records, it would have been impossible for 300,000 people to be massacred. Could you give us your thoughts about this? 4. In the book Documents of the Nanking Safety Zone, mentioned above, there is a list of detailed complaints against the Japanese army’s criminal activities. The list includes a total of 26 murder incidents, of which only one case was witnessed but it was judged to be a lawful killing and thus noted in the book. These records and your country’s claim of 300,000 people massacred are at extreme odds with one another. What do you think about this? 5. Numerous photographs said to be proof of the Nanking massacre are being displayed in books and at many exhibitions including the Massacre Memorial Museum in Nanking. However, it was revealed by scientific studies that there is not a single authentic photograph offering proof the massacre actually happened. If your country has photographs which can provide proof, please allow us to see them. We would like to examine them. 6. Given the above, it appears to us that the Nanking massacre could not have happened. But if you suspect that it occurred, we would like to ask that you conduct a verification examination in an objective manner with consideration of materials we will submit to you. In reality though, your country has built the memorial museum in Nanking, which is promoting the massacre of 300,000 people extensively. This act is unfair as it undermines history. Also, it amounts to a contradiction, since your country’s official position is promotion of a policy aimed at establishing friendly relations with Japan. Furthermore, as this year marks the 70th anniversary of the Nanking incident, various organizations inside your country are said to have planned movie productions about the Nanking massacre with many now under way. We perceive these acts as an unbearable humiliation to us who really hope to be friendly with your country. Could you give us your thoughts about this? We would like to receive Your Excellency’s replies to the above points. As this is a concern to many Chinese and Japanese alike, we are submitting the questions in an open forum. As we wish to maintain a strong friendship between China and Japan for future generations, we sincerely hope to hear from you. I think I did all right, given that I didn't study much for the test. The court's decision amounts to a not-guilty verdict. This decision is a humiliation for the president. Though Japan is a small country, there is a long distance express bus network between big cities and medium-sized local cities. You can move by bus from Matsuyama city (my hometown) to Tokyo, Osaka, Nagoya and Kyoto and vice versa. All of them are scheduled to leave at night and arrive at their destination in the morning. As you can see, the passengers sleep in the bus. They can work in the daytime. The transportation fee is set a little lower than that of any other transportation company. I've never used those buses, because I thought I couldn't sleep well in the bus. The vibration and the noise of the engine and tires would disturb my peaceful sleep. It's true that we can save time, but I like to see the scenery from the window of trains in the daytime or like to move by plane in a short time. However, my wife doesn't hate long rides on buses. She tried to use the bus. She left for Nagoya at 7:30 in the evening on Friday and came back at 9:30 in the morning on Sunday. That is to say, she arrived at Nagoya city at 6:30 in the morning on Saturday and left at 10:30 in the evening. She spend the daytime with our second daughter. It seemed that the bus was equipped with a restroom and more comfortable than she expected. She said to me, "Why don't you try it?" I've been to Nagoya city with my family for 2 days. I set up a new residence for Yuri, my second daughter. I received the room key from the real estate agent and the goods from the movers. Though I and my wife wanted to stay there a couple of days longer, we have jobs, so we had to come back to Matsuyama city on Sunday night. The accident happened on the way to Nagoya. There was a three-car pileup on the expressway just before the Takarazuka Interchange. I came off the highway with a moment's thought having seen the jammed traffic ahead. My car is equipped with a navigation system. I didn't worry about getting lost though I was stranger around there. About an hour later, I looked up and found the traffic getting better when we were in the midst of the traffic jam. Because too many cars went out of the express way and went onto the national road, a new traffic jam occurred. The national road was small, so the capacity was limited. We wasted 2 hours there. If I had stayed on the highway, the loss time would have been within an hour. We were so exhausted.